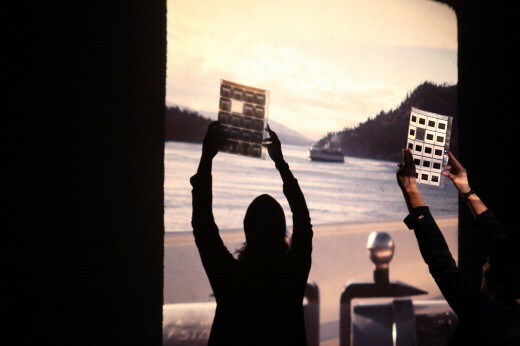 In the early 1970s, Maria Hupfield’s father, John Hupfield—a recent graduate from the first class of students in the media arts program at Sheridan College—made two projects about First Nations artists in Canada using sound recordings and 35mm slides. 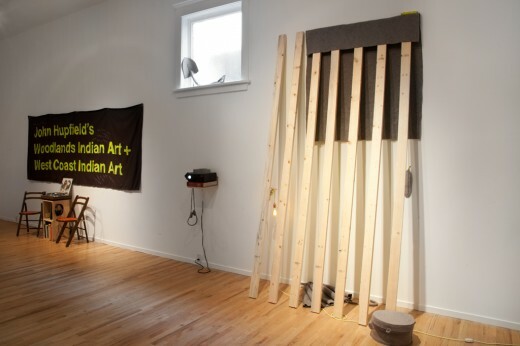 For her exhibition at Western Front, Maria Hupfield will use these two projects as source material to create a new body of work that explores these archives of cultural knowledge and the management of that knowledge by an outsider (her non-native, Canadian father) to consider possible models for settler and immigrant accomplices in conversation with indigenous peoples as well as indigenous to indigenous relations. 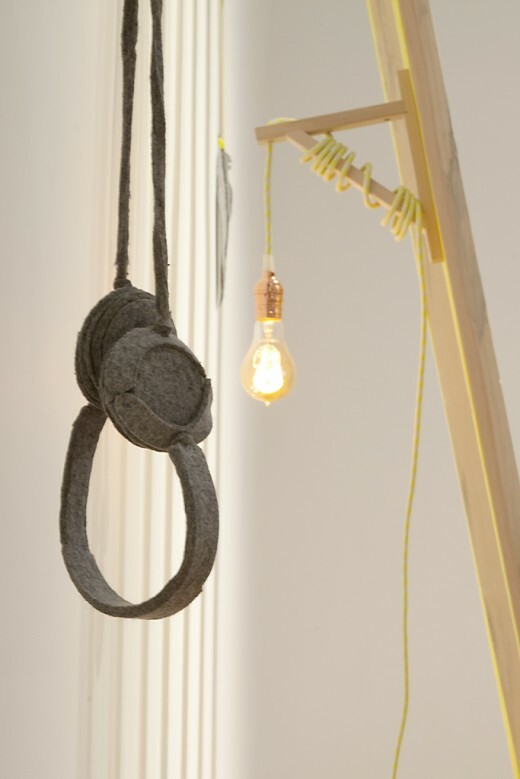 Hupfield will also invite artist Charlene Vickers to collaborate on a new performance. Charlene Vickers is an Anishnabe artist based in Vancouver, BC Canada. 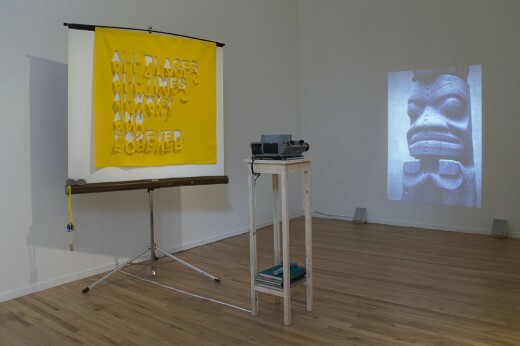 Recent solo exhibitions include “Asemaa/Tobacco” Artspeak and “Ominjimendaan/to remember” grunt gallery in Vancouver. 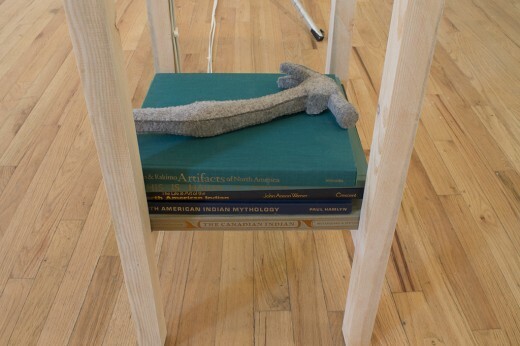 Her work has exhibited across Canada and the United States and toured nationally in the group shows The Fifth World at the Mendel Art Gallery in Saskatoon, (curated by Wanda Nanibush) and Custom Made at Kamloops Art Gallery (curated by Tania Willard); and can be seen in the permanent collections at the Museum of Anthropology, University of British Columbia. 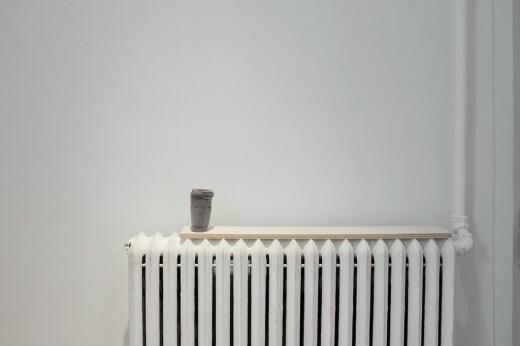 Charlene is an MFA grad at Simon Fraser University and is on the Board of Directors at grunt gallery. 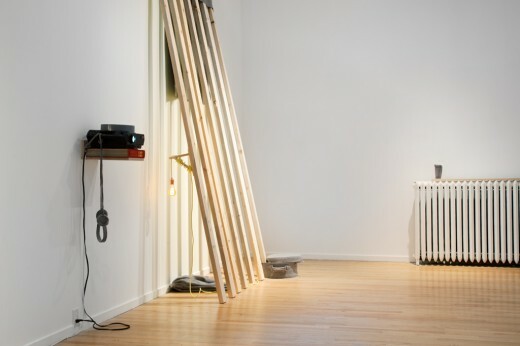 This past spring 2016, Vickers was selected as the inaugural artist in residence at Griffin Art Projects in North Vancouver creating a series of expansive abstract paintings, plus a new performance work with Chad MacQuarrie called Portals and Improvisations. 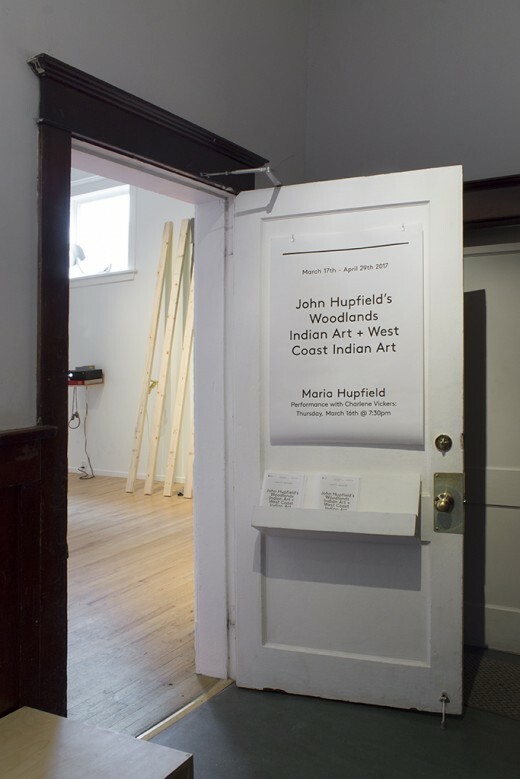 Maria Hupfield, John Hupfield’s Woodlands Indian Art & West Coast Indian Art, 2017. 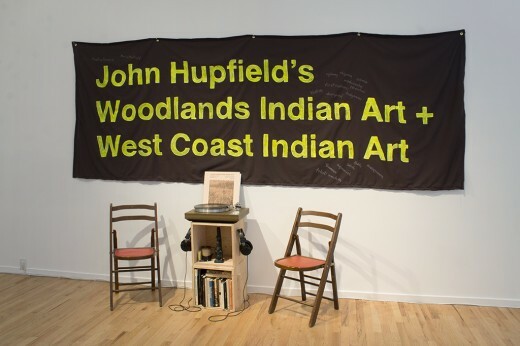 Maria Hupfield, John Hupfield’s Woodlands Indian Art + West Coast Indian Art, Western Front, 2017. Photo courtesy of Maegan Hill-Carroll. 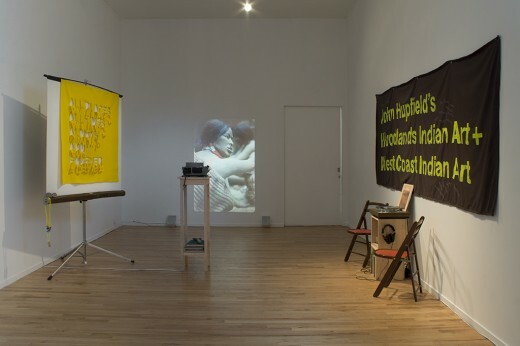 Maria Hupfield, John Hupfield’s Woodlands Indian Art + West Coast Indian Art (installation view), Western Front, 2017. Photo courtesy of Maegan Hill-Carroll. 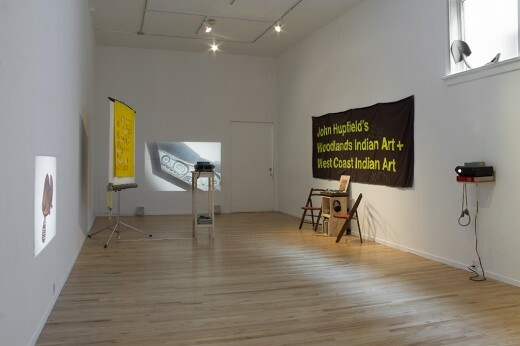 Maria Hupfield, John Hupfield’s Woodlands Indian Art + West Coast Indian Art (installation view), Western Front, 2017.